Crystalfile ‘Indicator’ tabs - new generation, rounded tabs that can be adjusted to mark file in use. Simply push down to angle the tab and mark the file in use within your filing cabinet. Allows easy access for refiling documents as you can see where documents belong. ‘Indicator’ tabs also magnify tab titles making it easier to identify your files. 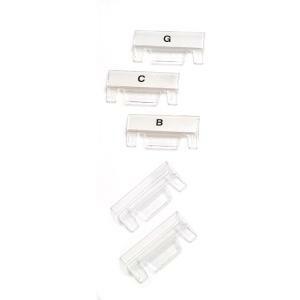 All inserts allow you to print your own tab inserts quickly and easily, for more information please refer to packaging. Available in a range of colours to easily colour co-ordinate and identify your files. Each pack has alpha (A-Z) and plain formats. Paper is 100% recyclable.